The results of IIT JEE Main have been declared on the official website on April 27. For the very first time, a 17-year-old boy from Udaipur has topped the JEE Main 2017 scoring an astonishing 360 out of 360 marks in the examination. Meet, Kalpit Veerwal, the JEE topper who studied only 7 hours a day and cleared the examination with full marks! In an interview with India Today Education, Kalpit said that he somehow knew that would top the examination but never thought of getting full marks. "I always had a feeling that I would get a high score but never expected to get All India Rank 1," Kalpit said. "Moreover, to my surprise, this morning the chairperson of the Central Board of Secondary Education (CBSE), RK Chaturvedi personally called me and informed me about my results," the JEE topper added. Meanwhile, he topped in both the General and Scheduled Caste categories. 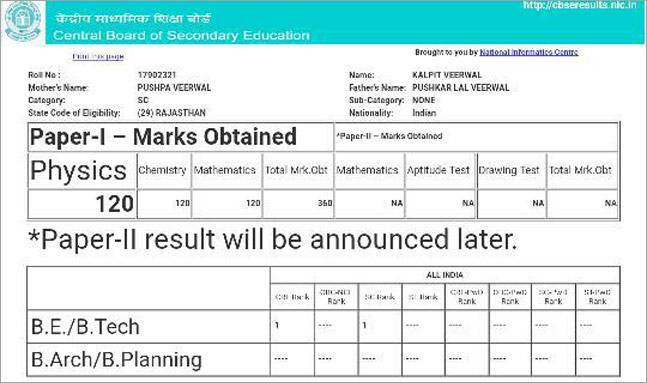 Kalpit's father, Pushkar Lal Veerwal, a compounder at a Government Hospital in Udaipur, is really happy with his son's score. While speaking about his interest, Kalpit said, "I always had a keen interest in Science and always wanted to excel a career in engineering filed." "To achieve my goals in life, I started taking coaching since Class 8 from a renounced coaching centre in the state," the topper said. Coming from a middle class family, Kalpit's mother, Pushpa Veerval is a Hindi teacher at a Government School in the state. Further, Kalpit has an elder brother named Hardik, who is currently pursing MBBS from AIIMS. While speaking on the success of his younger brother, Hardik said, "I am proud of my brother and everybody at home is really happy with his score." While speaking about exam strategy, Kalpit said, "I studied 6-7 hours a day and took break for some extracurricular activities like cricket and badminton to refresh my mind." "My parents and teachers were my mentors and they have been a great support during the exam time," he said. Kalpit said: "I would advise all the aspirants to do regular studies and should not take studies as burdens rather take it as a challenge." Now, Kalpit would be preparing for the next level of examination i.e. JEE Advanced which is scheduled to be held on May 21 by Indian Institute of Technology (IIT) Madras.